The Spring 2019 issue of The Lottery Times, the publication for Nebraska Lottery players, is now available at Nebraska Lottery retailers and online at nelottery.com. The Spring 2019 issue of The Lottery Times includes winners' information and articles on a wide array of other topics. 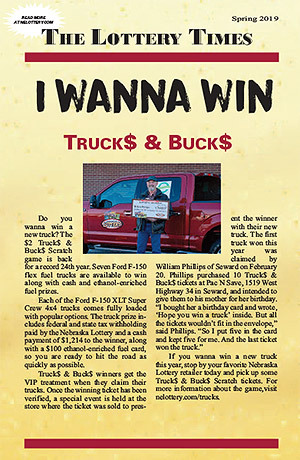 Beginning with the Truck$ & Buck$ Scratch game and ending with information on the signs of problem gambling, the Times gives readers a complete look at the Nebraska Lottery. You can also enter the Crossword Contest for a chance to win up to $91 in Nebraska Lottery coupons. Printed copies of The Lottery Times are available at Nebraska Lottery retailers statewide, and can be requested by sending your name and mailing address to lottery@nelottery.com. Please mention “Lottery Times” in the subject line.